The Fab Four: We thank thee, O God for our Prophet! 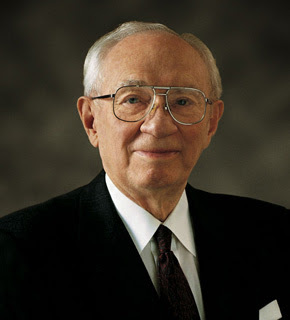 I have a testimony that President Hinckley was the Prophet of God here on the earth to lead us and guide us by Heavenly Father's voice. I am humbled when I think of him and the amazing works he did on this earth for everyone around him! I am so grateful to have lived in the time here on the earth when he was our prophet. When I was serving as a missionary in Sao Paulo Brazil he came down to rededicate the Sao Paulo Temple. The Brazilian's put on a big show for him and I was there to witness it!! Pres. Hinckley spoke to the brazilians as well Me and Bry figured out that we were in 8th grade when he became the 15th president of the church. WOW!! We feel old. President Hinckley is Bryan's great Uncle. His Grandma Call who passed away from a car accident when she was in her 40's was the sister of Majorie Pay Hinckley. Bry's dad tells us stories of when he was a little boy and how he got to go visit Uncle Gordan and Aunt Marj in their home. That is something special that I know of Pres. Hinckley. I love this man and know that he is happy with his family and his wife that have passed on. What a rejoicing time in the Heavens! Bri-when I heard this morning about him, I thought, I'll bet Bri has a tribute to him on her blog today. Love you, love you! I had to do one too. I add my testimony to yours that he was indeed a prophet. And we loved him very much and his teachings and revelations, are something that we will try to follow. It has been very wonderful to have his influence in our lives as an uncle too.